Bullying Beliefs make us believe Bullying is Acceptable... Surprised? It is sad but true that our society has beliefs that support bullying and bullying behaviors. Some bullies grow up to be very successful and become CEO’s of companies... So, what is the problem? The problem is the majority of Bullies end up having difficulty dealing with conflict all their lives which means problems in relationships, criminal violence and jail time. Of course, the flip side of that is the child who is bullied does not get help which can lead to many long term effects, a lifetime of victimization or worse...bullycide. As Parents we need to stop making up excuses and minimizing the damage being done. There are long term consequences for everyone involved. We need to take a good hard look at our Beliefs and challenge them on a regular basis. Bullying beliefs are simply beliefs that have been repeated and accepted. It DOes not make them RIght. In my opinion, these beliefs themselves are part of the problem. To think the only way to get ahead is to bully and hurt someone else is shameful and does not reflect our humanity. Really, Bullying is about continually, repeatedly attacking a person who has less power than you with the intent of hurting them because you have contempt for them or because you can’t figure out a better way to get what you want …AND then, have society make it ok...that is inexcusable. The problem is violence has become socially acceptable. 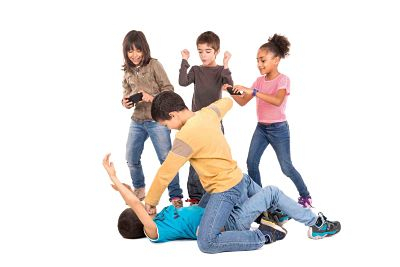 Movies, games and ultimate fighting... all started as entertainment but it is de-sensitizing us to violence causing us to accept levels of aggression and bullying never before seen. Got a problem? Just hit someone and make it go away. Want something? Manipulate, verbally abuse and belittle someone till they give it to you. Really?? For those of you who do not recognize it that was sarcasm... These are bullying behaviors. If a child is bullying he needs help. If a child stands by and watches bullying and does nothing…well, need I say it…the child needs help. The fight took a turn for the worst and one of the boys got on top. The Boy was pummeling the child on the bottom…I heard a Mother…(YES, an adult)…yell…”Yeah get him Johnny…hit him again…harder”…Well, that was it…I could not believe my ears. Before I knew it I stood up and yelled “Hey, break it up” and started marching over to the boys. Bullying Beliefs are simply beliefs about bullying that have been repeated and accepted. It does not make them True. The truth is Bullies do this because they have issues meeting their own needs and bullying meets those needs albeit in a negative way through picking on other kids. This can have long term effects on the Bullies ability to cope with life as they grow up. Many turn to crime and end up in jail because they never learned that violence does not get them what they want. (Of course, fair is fair...they also sometimes use their ability to control/manipulate to become CEO's under the guise of leadership) They need our help. Bullying is becoming more severe because as a society we have these Bullying beliefs. Bullying does not have to be a part of childhood. The first step in changing these beliefs is to challenge them. If you hear any of the above you can politely advise the speaker that bullying is very real with serious consequences. My guess is if you are reading this website you are a parent who has a child involved in bullying. Regardless of the part your child plays you will most likely hear one or many of the bullying beliefs. Our job is to ignore them and guide our children to deal with life without bullying. It is important to check in with your child regularly and talk about bullying. In order to Stop Bullying we need to get beyond these old, over used Bullying Beliefs and move forward. The second step is to support your child to problem solve without violence. Build their ability to empathize, communicate assertively and be tolerant. Character building is an important part of our job as parents and we can model and help them learn these traits as part of our daily routine. Helping our children develop emotional intelligence will allow them to be successful in relationships and in whatever career they choose without Bullying and its negative effects. Please Share bullying beliefs not mentioned above. It will help everyone be more aware ! Have you heard any bullying beliefs ? Share it!